The last time I was in Barcelona I was five, and quite obviously I was not on a girls’ getaway, but on a trip with my family through France and Spain. We spent three glorious weeks visiting Spain and Barcelona was the one of the highlights of our trip. I do vividly remember this visit even though I was so very young. Barcelona’s beauty made a deep impression on me with its searing bright sunshine and blue skies lighting up the ancient gothic architecture. I would love to travel back to this lovely city one day with my mum and retrace the journey we took so many years ago to the La Sagrada Família cathedral. But perhaps this time it will be me holding her hand to help her up the many steps of Barcelona’s most famous cathedral (editor’s note: So sad, I recently found out that you can no longer walk up the steps of the cathedral). Recently I was fortunate enough to connect with the lovely Max, one of the managers at The UrbanSuites.com, a fantastic modern hotel/apartment complex in the lovely neighbourhood of Sants in Barcelona, Spain and he very kindly sent me these insider tips on Barcelona for any of you lucky girls who are thinking of heading out that way soon for a fun girl’s getaway. Beautiful Barcelona, the second largest city in Spain is making a name for itself as one of the liveliest city in Europe and is considered to be Spain’s new Capital of Style. This is the medieval part of the town and although it tends to get very crowded, it is a definite must see for any travelers visiting Barcelona. This district is on the left side of the La Rambla, Spain’s busiest street. While in the Quarter be sure to visit: The Cathedral, The City Walls, Plaza del Rei with its Museum and Plaza Sant Jaume (Town Hall). Another great spot is the El Mercat de la Boqueria: one of the most popular markets in the city. The building which houses the restaurant was originally designed by architect Josep Puig i Cadafalch, and was used as a Modernist painters hangout during the early 1900’s. Picasso was one of the artists that would frequent the place and held one of his first one-man shows in this very spot. Take a stroll along the narrow streets of the Born, this district faces the sea and boasts the stunning newly rebuilit Santa Caterina Market. It’s a perfect place to hang out during the night with its many tapas bars, restaurants and loads of shops, but make sure that you also visit during the day so you can get a closer look at the architecture, some of which dates back to the XIX century. Another interesting stop in this area is the Picasso Museum. El Xampanyet. C/Montcada 22. Barcelona. An authentic catalan tapas bar that has become popular (and expensive) among tourists. This place serves great traditional Catalan food at reasonable prices. If you like seafood, this is the place to be! You chose what you want fresh from the fish ‘bar’, decide how you want it cooked, then you pay, get drinks and side dishes as your fish is being prepared. During the weekends it’s packed so try to arrive before 9pm to avoid long waits for service. This area was recently renovated in the early 1990’s and is a perfect place to stroll towards and along the beach. Close to the beach you’ll find the Catalonia History Museum: A must in order to understand the troubled (and sad) history of the Catalans, a very proud people who are passionate about their culture, roots and language. Barceloneta – this area was originally a fisherman’s village and it has still retained its Mediterranean atmosphere after being almost completely rebuilt in recent years. This is where the old port meets the beach and it boasts the best fish restaurants in town and is also famous for its long sandy beach, which is popular all year round. Behind Barceloneta you’ll see the Mare Nostrum Tower, a spectacular 20-storey glass tower that combines the vertical lines of a skyscraper with an imposing horizontal canopy. Its sinuous, modern architecture has made it a landmark in the Barcelona skyline. 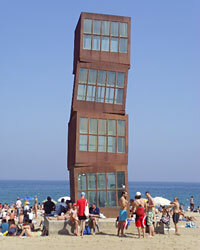 If you make your way to Villa Olimpica (the Olympic Village) you can see Barcelona’s two tallest buildings, the Port Olimpic Towers built for 1992 Olympic Games, and at the feet of the towers you’ll find Frank Gehry’s Peix: a giant fish standing 35 meters high, made from woven strips of copper coloured steel. Nearby you can find the Barcelona Casino and loads of restaurants and bars. L’Escamarlà Pg. Marítim de la Barceloneta, 40, Barcelona. A wonderful restaurant located directly on the L’Peel seafront, with beautiful views of the Mediterranean sea and beachfront terrace. The menu offers simple but well prepared seafood, rice dishes and excellent fries. Occupying about twenty percent of the entire town, Sants is Barcelona’s largest neighborhood. The main attraction is Montjuic, a small mountain located southeast of Barcelona’s city center. Its unique vantage point offers the most stunning views of Barcelona and the Mediterranean. The top of the hill can be reached using the Funicluar de Montjuic, a funicular railway that operates as part of the Barcelona Metro. Here you will also find the 1992 Olympic Ring alongside the Estadi Olimpic (Olympic Stadium) and the Palau Sant Jordi a popular place for concerts and events are arranged throughout the year. Not to be missed is the Fundacio’ Miro’ Museum, here you’ll find a large selection of Miro’ works. Joan Miro’ is one of the most important leading figures of surrealist movment together with Salvador Dali. Montjuic hosts also another important museum: MNAC Catalan Museum of Modern Art which is housed in Palacio Nacional, a landmark that stands out against the Barcelona skyline. At the foot of the Museum you will find the Font Magica, a beautiful fountain built for 1929 World Exposition, attracting hundreds of visitors who enjoy its spectacular display of light, water and music. A wonderful, down-to-earth restaurant with superb Basque and Catalan food and staff. One of Barcelonas’s hidden gems. A restaurant with fresh market cuisine, its specialty is catalyn style seafood at reasonable prices. If you are thinking of heading to Barcelona on a girl’s getaway be sure to look up The UrbanSuites.com for your accommodations. With its two bedroom suites, it would be a perfect place for any group traveling in Barcelona. Max & Isabel says to just mention that you found them on girlsgetaway.com, and nice treatment will be guaranteed!